Home > Mother's Day Dinners! > Lobster Clambakes! > Lobster Clam Bake Dinner for Two! 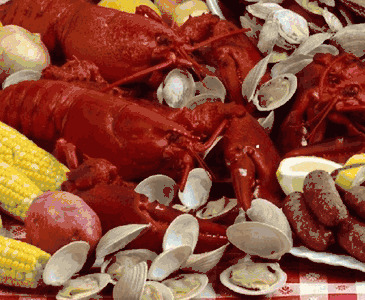 Our Best Selling Clambake Dinner Gift! Enjoy or Send one of our most popular items, one that will get both of us rave reviews! A Complete Lobster Clambake In It's Own cooking Tin And Easily Prepared Right On Your Own Stove, Just Add Water And Steam! • Two 1-1/4 pound Live Maine Lobsters; • Two Quarts of Little Neck Clams; • Two pieces of Sausage Wrapped in Flounder Fillet; • Two Servings of Red Potatoes, Sweet Potatoes, and Onions; • and Two pieces of Corn on the Cob! It's all in its own cooking tin with instructions and also includes Two complete Lobster pick sets! Order This Complete Lobster Clambake Dinner For Two By 10 am EST, And We'll Ship It To You Overnight In Time For Dinner Tomorrow, Right In Your Own Home! Our Clambakes Also Make A Great Gift Idea! This was a gift and it was really great! easy to prepare and top quality seafood! We had leftovers there was so much in the container. Great Idea, Thanks TAMMY!!!! Sent the Lobster Clam Bake Dinner to my son in Montana for his birthday. He was amazed with the quantity and quality of the food. He really appreciated the fact that you just add a little water to the pot and put it on the stove.Thanks Lobster Guy! We have ordered from others in the past and this Clam Bake is the best! Everything you need is enclosed in one cooking container and all you do is follow the simple directions and everything comes out great and delicious. We live in the South but travel to New England visiting relatives. This by far is the freshest best tasting clambake I have ever had. You're not far away from the ocean on this one! We sent this last year as a Christmas gift to my parents who have moved South and what a treat it was for them! Everything was fresh and delicious. They LOVED it and ate every bit from the clams to the lobster to the corn! Much better than a gift that will still be in the box next year! Can't wait to send it again this year! Wow! We surprised my husband with the lobster and clam bake for Father's Day in anticipation of our upcoming trip to Boston, and he LOVED it!! Everything was packaged in a way to make cooking effortless, and the lobster tool kits were so much fun. We couldn't believe how much food there was for the price. It's a great deal. And finally the food itself. Wow!! It was absolutely amazing, perfectly cooked by following the included directions, and we still couldn't finish the entire thing in one sitting. I can't wait to order again and share these meals as gifts in the future! Our son sent this to us for our 50th Wedding Anniversary. It was a surprise and was absolutely wonderful. We almost ate everything. The lobster was excellent and the trimmings superb. Fantastic. Thanks to our son and you folks. The lobsters, the clams, the fish and the veggies to top it all off! I can't describe how good this was! Makes an incredible gift, let me tell yah! Best online purchase I've made in a long time! Ordered this as a gift for my Dad's birthday and all I can say is WOW! I haven't seen my old man smile like that in a long time! Really easy to cook and all the food was delicious, especially the lobsters! Thanks Captain Tim! This was one of the Top 5 best meals I've ever had in my whole life!!! Best seafood gift ever! Highly recommended! This is a lot of food! It was fab! loved every bit! I cannot begin to tell you how wonderful our clambake was! From delivery to eating it was easy and worth every penny! The quality of seafood that came was over the top! You have a customer for life! Sally R.
All I Can Say Is Wow! This is a LOT of food! The cooking tin was full to the top of lobsters and clams and all the goodies of a real beach clambake, and we cooked it right on the stove! Best online gift we ever received!